I think I drafted my schedule for classes. I think. When I went through the program GW has called Blackboard, it brings you through a run don of what is required for the specific school you in and major. The first year we have a bunch of required courses to take so I didn’t have much choice. But that’s okay. That made it a bit easier. What I did have a choice in was the language I am going to take. Say good-bye to Latin and hello to Arabic! Since I want to minor in Middle East Studies, Arabic seemed like the prime choice and I have always been intrigued by it. And if I got through 4 years of Latin, culminating in AP, I think I will be able to handle Arabic…hopefully. I will just have to get used to actually speaking another language since in Latin it is only translation of books, not speaking or conversing. Fingers crossed! But besides that, the whole writing down a tentative schedule was so overwhelming. There were just so many numbers and words and charts. I did pick mostly early morning classes since that is my prime time. We have to bring these drafts down to orientation which I will be going to in a few weeks and then hopefully our academic advisers are supposedly supposed to help us out and guide us to a more concrete idea of what it should look like officially. Then in early July we have a schedule day to go online and register. Hopefully I will get all of my choices since I want all the earliest classes, haha! I guess you can say the one perk to high school schedules was that you just input the class you want and then when school starts they hand you your computer generated schedule. You don’t have to deal with the time, place, etc. But that also leads to a lot less freedom. All I can do now is just wait and see what my adviser says. And then stress on the day I actually have to register. 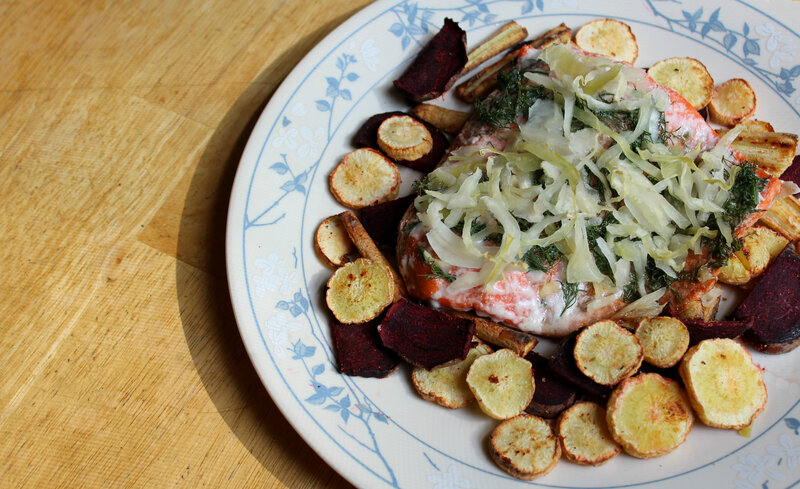 Until then…how about some salmon. Salmon is one of my favorite fishes. It is so different than white fishes like Tilapia and Flounder. 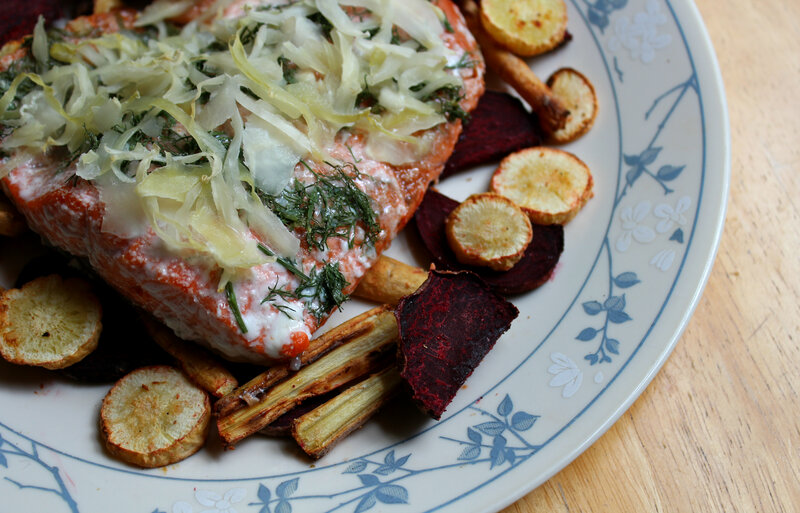 The fats in salmon just bring the taste to a whole new level. It is such a satisfying protein. And now that Wild Alaskan Kind Salmon is finally back in season for the summer, I am one happy girl! 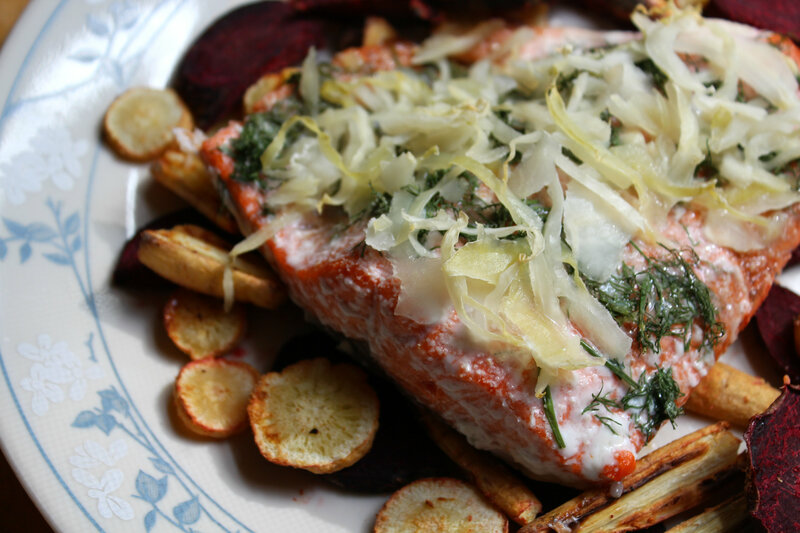 Winter salmon tastes terrible, but summer salmon…o…so good! I need to get my hands on as much of it as I can before it’s gone! But another fish I just tried last week was Trout! It was my first time making it and I am glad to say I have a new favorite! Trout is a bit heavier than Tilapia, but less so than Salmon. It is the perfect medium! Today though, lets stick to salmon talk. 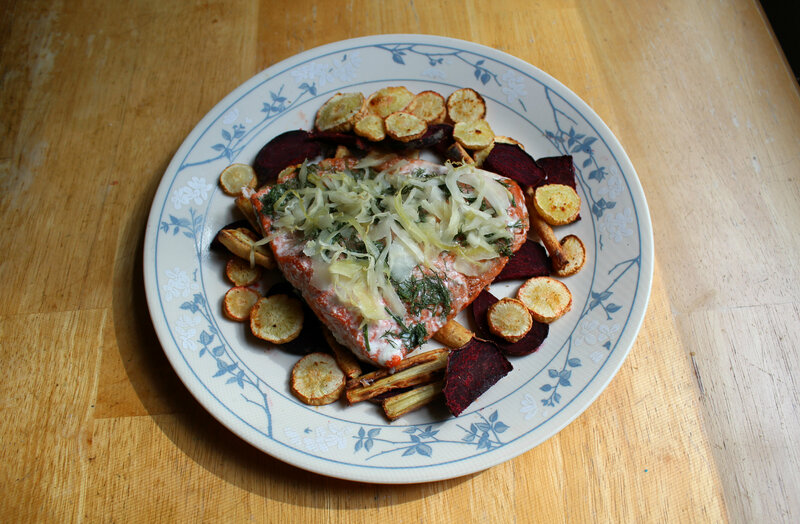 Salmon with dill (dill is so good on fish) and my beloved saurkrout! 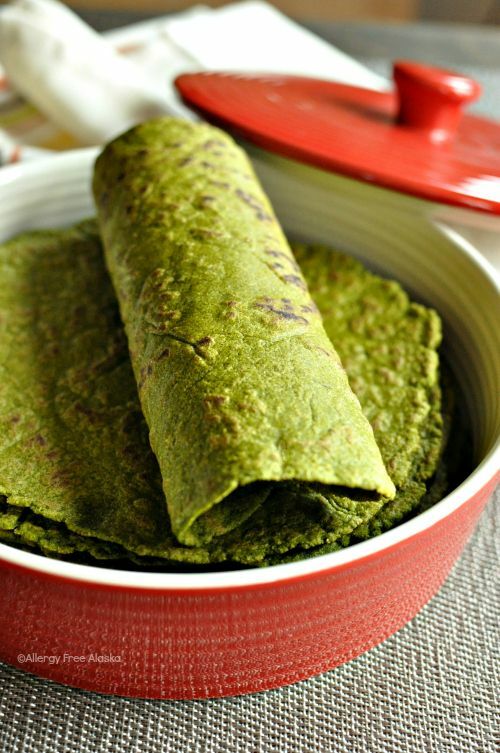 Two superfoods and happy tummy making foods in one! 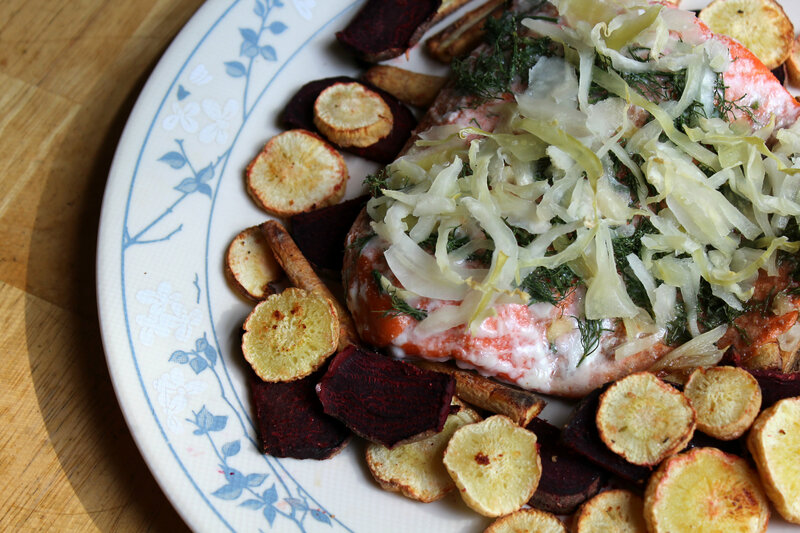 Plus this is all served with a side of roasted beets and parsnips, my favorite roots! + Preheat oven to 400°F. + Rub salmon with balsamic, garlic, and onion. Then top with the dill and saurkrout. + Place it on a foiled and oiled baking sheet and cook for 15-20 minutes or until the salmon is done and flakes apart easily. + For the beet and parsnips, preheat the over to 425°F. + Once everything is chopped, place it on a foiled and oiled baking sheet, and toss with garlic and onion. Bake for 30 minutes, flipping halfway through. A satisfying protein packed meal! So satisfying, the food just can’t wait to get in my stomach. Let me explain. When I was eating this…I was at my desk on my laptop (yes, bad) and I had the plate to the side on the edge of my desk, reaching over with my fork. Well I guess it tipped and just before the whole plate fell and got all over my rug, I caught it with my arm…sort of. I saved most of it, but a lot of it ended up on my clothes, in my hair, yes and some of the floor. I also has ketchup on the plate since I love ketchup on all roasted veg. The ketchup was the worst part. It was all up my arm and sleeve. So lesson learned, either pay attention to how you are reaching with your fork, or just don’t eat at your desk while on your laptop. + Did you get stressed out making your college schedule for the first time (or any time for that matter)? + What language did you take in college? Am I setting myself up for failure taking Arabic?! + Tell me you have spilled your plate all over yourself before? I can’t be the only careless one! Even though I woke-up at 3:30am on Friday to the pouring rain and thunder, knowing that Graduation would 99.8% be held indoors, I ended up having one of the best days I’ve had in a while. (Totally trumped my birthday the previous week!) And I guess you could say it was a marvelous day too! The only way to relive this day is to show you a slew of bad quality photos that I will forever hold near and dear to my heart! So after I woke-up I did the usual morning routine to get ready for “school” one last time. My mom and Jimmy decorated the kitchen with balloons and graduation banners, a nice way to brighten the dark gloomy morning. I made a delicious breakfast of some buckwheat cereal with cocoa powder, peanut flour, and vanilla stevia (I need to share this non-recipe with you!) and fresh summer blueberries and strawberries. Two things going good so far…take that Friday the 13th! I drove in the pouring rain to the school, parked and waited for the rain to let up before running from the parking lot in to the cafeteria where the PTSA was holding a pre-grad breakfast. From there we had to wait over on hour before we got our caps, gowns, and cords. 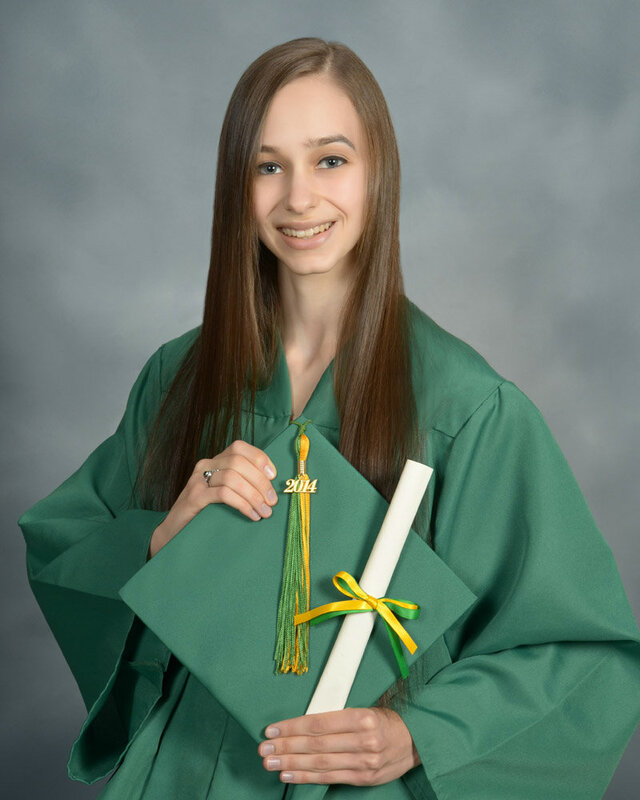 I had a purple and gold cord for Latin Honor Society, and a surprise-to-me yellow cord for high honors (a GPA above a 4.0)! Woohoo! Since it was still pouring out, we couldn’t even practice outside, so inside practice was our only option. We got that done pretty quickly, then put our gowns on to take a few class pictures, and then I booked it out of there and headed on home by 11:15! When I got home the sun came out shining brighter than ever. Really?! O, Mother Nature. But I was still in a great mood and full of energy. So I got in a crazy good workout that left me even more energized. I was literally jumping out of my skin excited and happy at this point in the day. 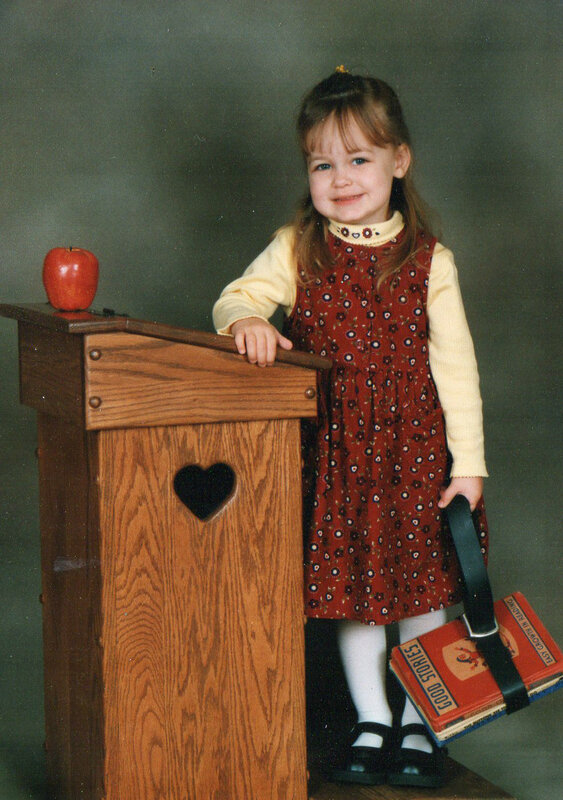 The rest of the time before graduation flew by. I got all dressed up in a black dress and black stilettos (hoping I wouldn’t trip and die, but since it was inside, the chances of that we very small. Plus I have had those shoes forever and never got to wear them, so why not on this glorious day? ), had dinner at 4:30 and then we headed back to the school. In the meantime the storm came back full force! 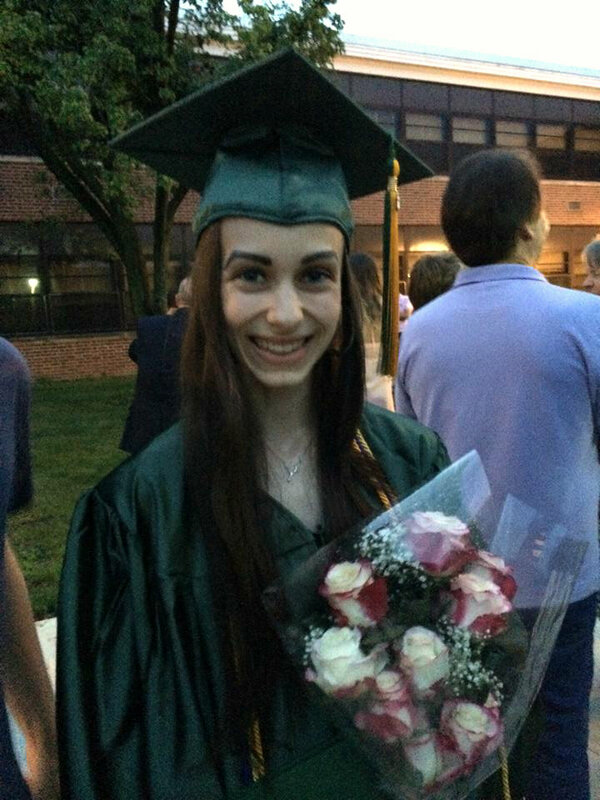 We met my grandparents there, I left everyone to sit in the gym for hours before the ceremony started at 7pm and went to stand in the cafeteria with all the students taking pictures and waiting anxiously to get this show in the road. Then it was finally time to proceed in. Things were getting real now! But still not really real. It still seemed surreal at this point. Here I am walking in to the gym. Then the numerous speeches by the principal, top 7 students, the super-intendent, and the choir. It actually went pretty fast, but I started to drop at this point. My energy was slipping. Way to close to my bed time now. The adrenaline was wearing off. 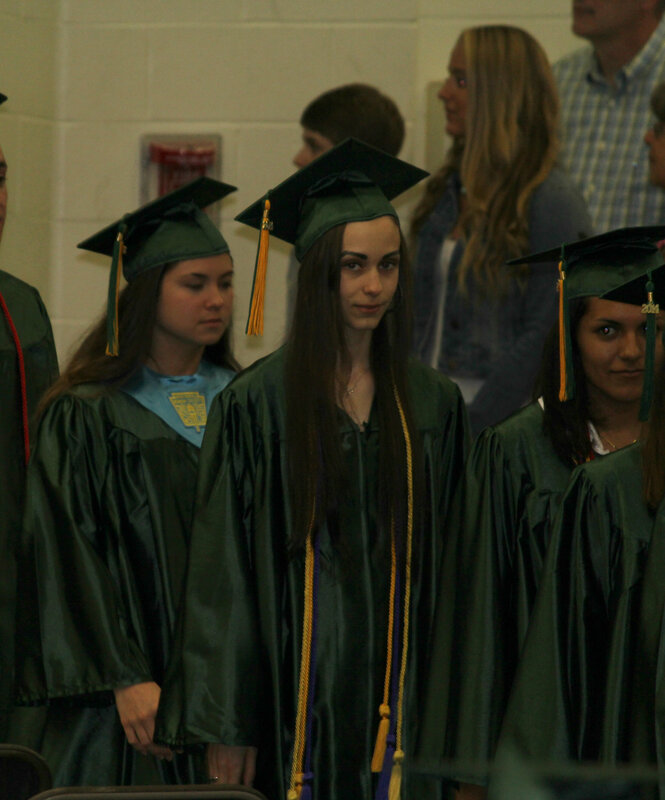 But…soon they started calling the names of the students so I had to stay awake! I am close to the end so I had a ways to go. But it finally was my turn. After I sat back down, and the names we all through, I started getting the chills. This was real. I had just graduated. The obligatory throw your cap in the air (I did a small toss since I didn’t want to lose it!) and we proceeded out of there! (only an hour and a half for my class of 430! Yay, it was quick!) Did this really just happen? 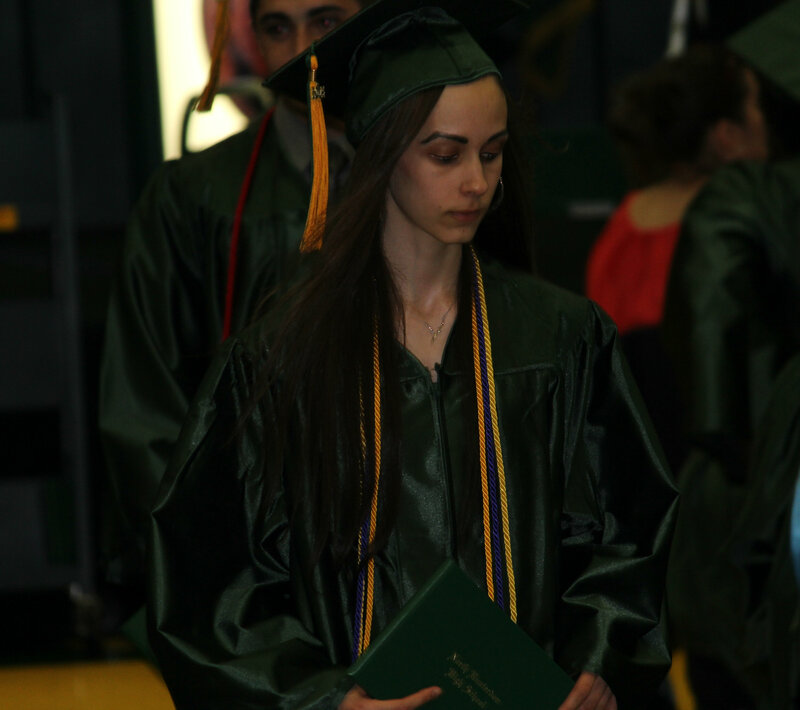 But then I had to push through crowds of the new grads and get my diploma, then walk all over the school trying to find my parents, Jimmy, and grandparents. I should have stayed in one spot, but I didn’t and those stilettos ceased to be my friend. I finally ran in to my Jimmy and my dad and we headed outside to my grandparents and mom and take a few last pictures before we left. Then I was so exhausted, my dad and Jimmy took me home so I could eat something, take a shower, and hit the hay! They all went out to dinner though with my grandparents after they dropped me off, haha! But that is fine by me! Eating out is torture anyway 😉 I ended up getting a bit side-tracked on Facebook and twitter, but hey, I had to share my happiness and jubilation with the world! I got to bed by 10:30, fell asleep right away, and woke-up, no longer a Lion, but a fresh new GWU Colonial! They only way to celebrate on Saturday morning? 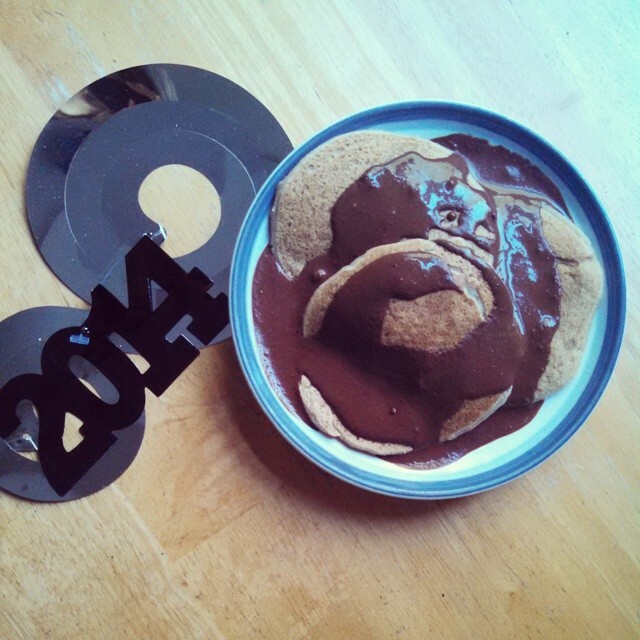 Pancakes of course! Now it is time to savor the Summer and get ready for a whole new world/life/experience! I think it is still going to take a few days for all this to sink in. 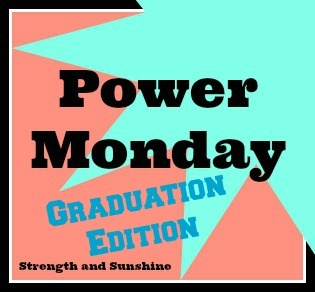 Until then…have a Happy Power Monday! See you back here to tomorrow with some things I am loving lately and the winner of the Skoop Giveaway! Enter by tonight for your chance to win! 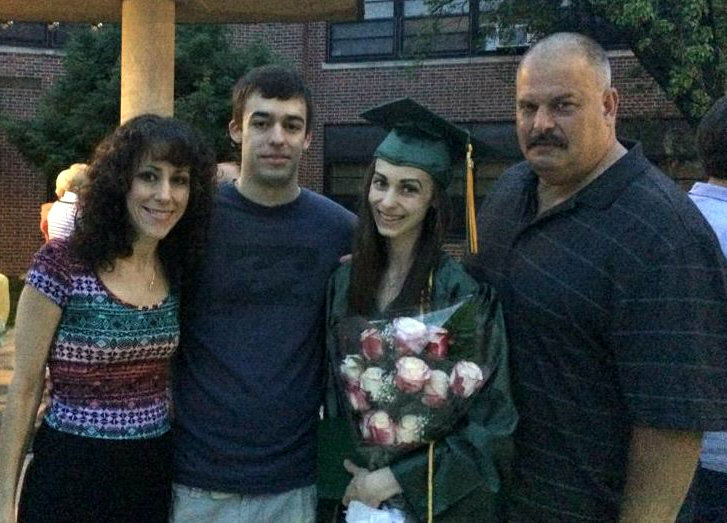 + Did it take awhile for reality to sink in after you graduated? Did it feel real right away? + Tell me something marvelous about your weekend! This post is going up in the morning obviously, but please cross you fingers and pray to the nature gods that it will not rain today! I go in to school normal time today for a “pre-grad” breakfast, getting our gowns, and then the long grueling graduation practice. We will practice outside once and then practice once inside in case there is rain tonight. But if it rains during the day, we won’t even be able to practice outside to begin with. I am pretty sure this bad luck is stemming from the fact that it’s Friday the 13th. O the ironies. But we have to stay positive right? The only plus o having it inside is that I won’t trip and fall walking down the huge hill to my seat. And everything goes a bit quicker. But if it is inside, there are limited seats and only my Mom, Dad, and Jimmy can come. My grandparents won’t, which they were planning on doing. 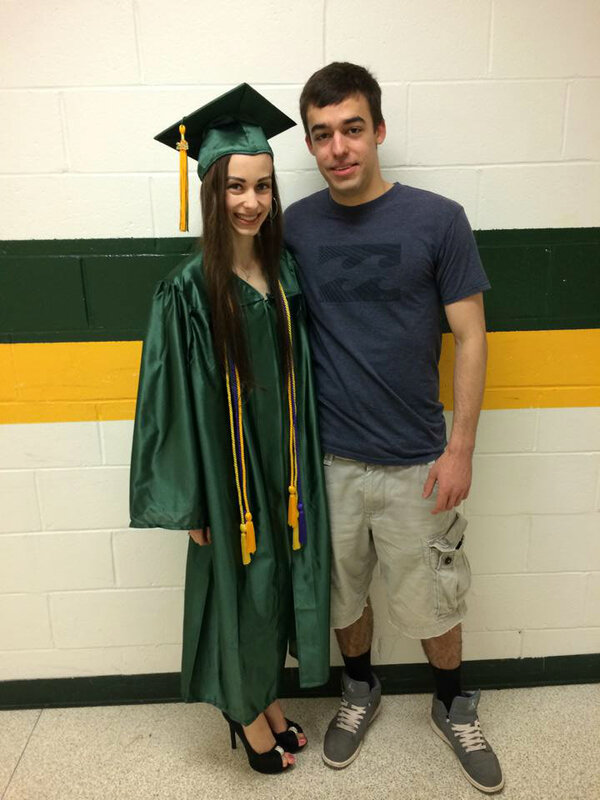 After grad practice, we go home and then have to come back I around 5:30 I think since the ceremony starts at 7. I just hope I don’t fall asleep before I get my diploma! I have been going to bed at 8:30 the last few nights, and it has been glorious! 😉 I just can’t wait for tonight though! I will officially be a grad by 9 o’clock tonight! This day is going to be so surreal. 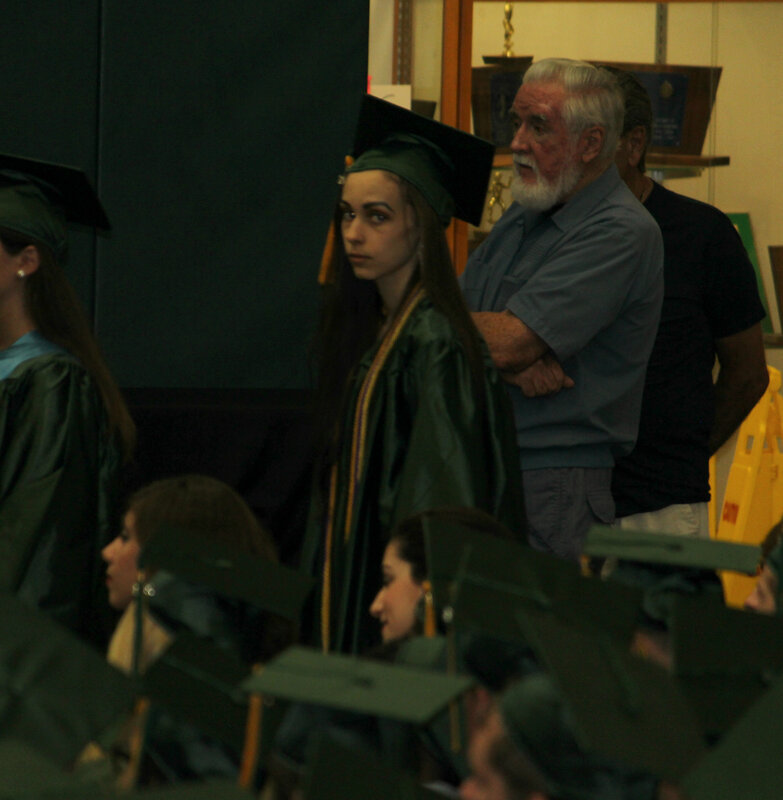 I really do not feel like I should be graduating? Wasn’t I just a freshman?! Dear Dad, I don’t get to see you much anymore, we don’t talk much either. Even though our relationship isn’t as great as it could be, that will never change the fact that you are my dad and will always be my dad. I will always love you and always be there for you. You are my big teddy bear when I need a hug. You are my protection with you strength. You always make me laugh even when you annoy me 😉 You carry me when I break my toe on the beach. You go on a cray 19 mile bike ride in the heat of June with me. You go on random car rides with me to take photos for school. You drive 16 hours to a dance competition and then back the next day all by yourself. You’ve held me in your arms and cried. You will one day walk me down the aisle, our arms linked, a symbol that we will always be there for each other. I love you daddy. 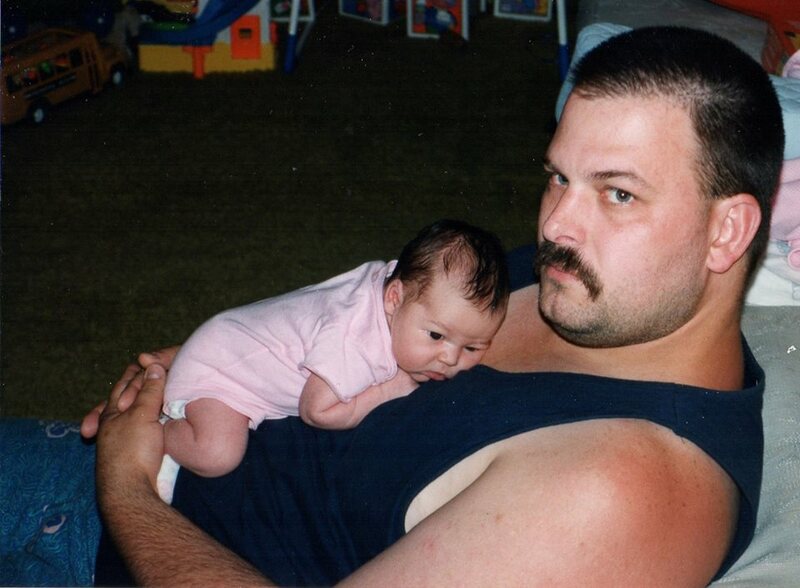 I hope you are proud of me and that I can always be your little girl. Worrying all the time is simple just not worth it. A great lesson learned from the perspective of the young innocent mind. Really great post! What defines a “real woman”? Embrace what you do have! They have the right idea 😉 Why can’t we all keep this care-free attitude? We had it one time, so let’s channel it again. Where Gina is right now and her post-bacc years. Wow. Would you be able to do this? Very interesting on how culture and our own self-esteem can dictate this and what “happiness” means. I want to see real too! + 5 Tips On Living A Happier And More Positive Life! Katie always knows how to make herself glow! Wow, wow, wow! Must read! Are you the mom you want to be? Are you present in your child’s life? + Is Less Really More? For somethings more is better than less! On taking that leap of faith in the real adult world. Ever find yourself resisting and delaying getting things done? Expanding your practice one on one with a teacher. A little help for the newly certified. In the market for a new pair of kicks? This can help! Are you a dumbbell junkie? Yes. But I also use my barbell and only really use my kettlebell for swings. You should only be focused on what works for you and what your body needs. You don’t truly know how anyone else eats all the time either. These are some great “rules” to implement! Don’t worry, no diets and restriction here! Gabby breaks it down so you won’t break down! Why the choice was just no longer working for Heather. My future palace! We will be together again, very very soon! Ditching the shoulds and getting real about wellness. A letter to a new blogger after 5 successful years of blogging. + I’m Not A “Perfect Blogger” And That’s Okay! We don’t need to be perfect. We are normal people too, just like you. With real lives, feelings, and everyday struggles. Okay, so this might be my other top favorite post this week! Read it! Some of these look really great! I’ve never tried LUSH, but I may just have to! 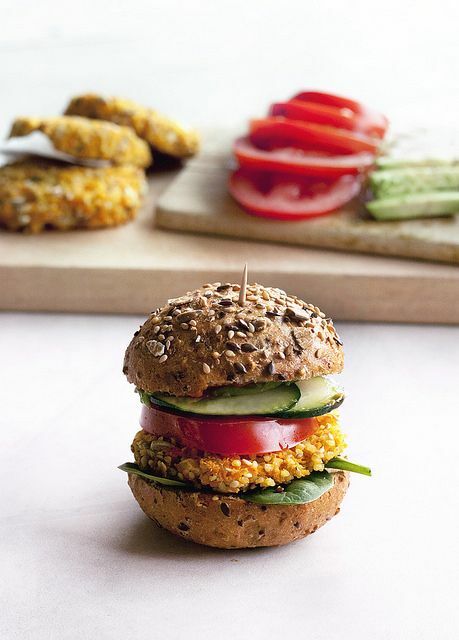 Millet and Carrot Veggie Burger. Yummy! Full of goodness and perfect for Summer cook-outs! 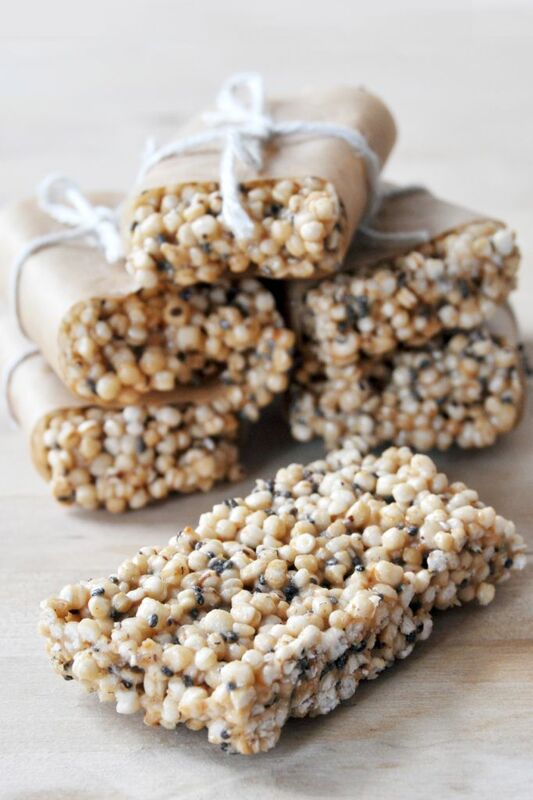 Quinoa-Chia Freezer Bars. These look like so much fun! I loved puffed grains! 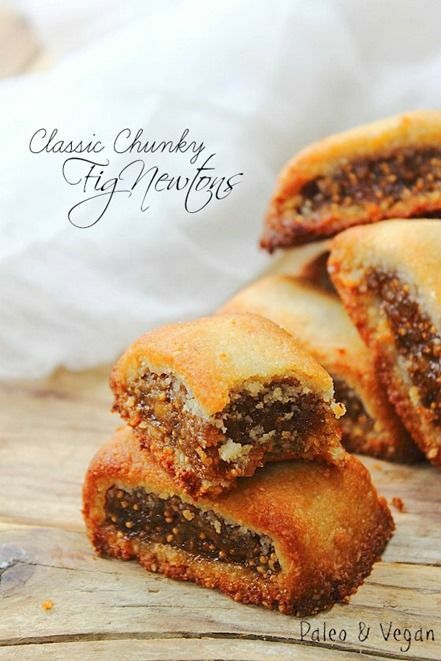 Chunky Classic Fig Newton’s. Michelle said she would be posting this recipe this week and I could not wait! These look so fabulous! I always had a weird things with Fig Newton’s. Sometimes I liked them as a kid, other times I hated them. But that was many many moons ago! 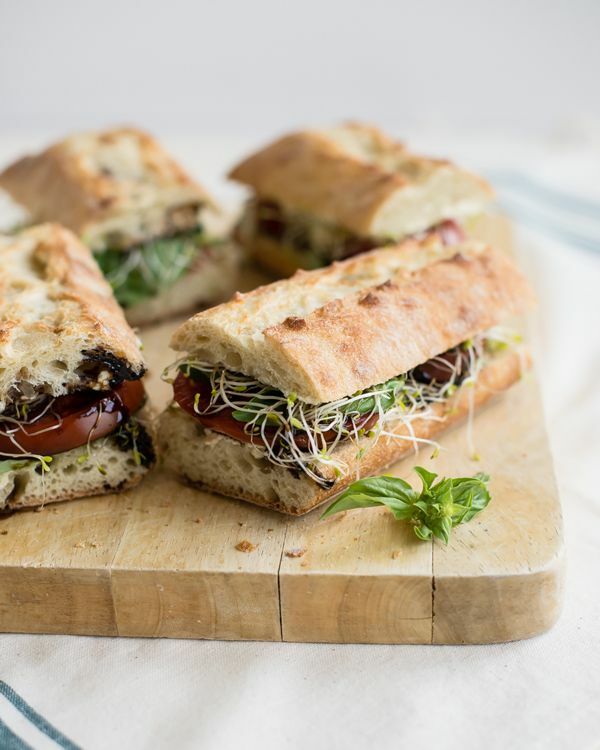 Vegan Caprese Sandwiches with Garlic Cashew Cheese. 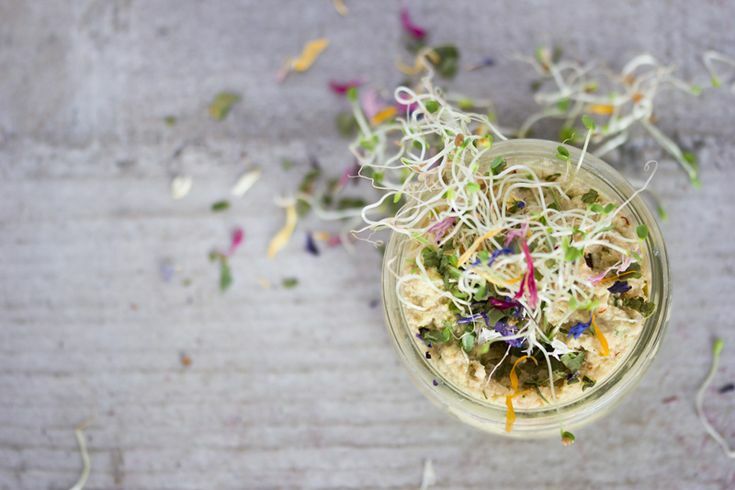 All you need now is some gluten-free bread and your good to go! 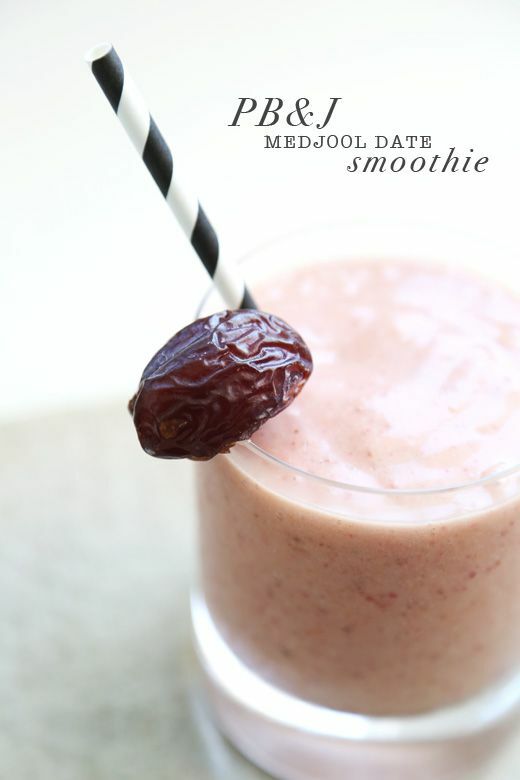 PB&J Medjool Date Smoothie. Really simple, but this is really calling me to make it! + Summer has officially begun. Really. Now it is time to make the most out of every single day until I leave for DC! + With Summer now in full swing, that means I don’t have to pre-write all my blog posts a week in advance! I can to same day blogging and actually talk about my life! Woohoo! I have so many ideas, recipes, things, and stories to share with you! Thanks to my handy multiple notebooks and Google Docs, I can remember all this stuff to share! + I think I may have found a yoga studio to do training at this fall down in DC! I am going to contact them this weekend and them maybe set up a meeting when I go down for my college orientation at the end of June! I will keep you updated! + Was your graduation inside or outside? Was it due to rain? My brother’s was outside and it was good (and so hot! I got sunburn of course!) But I was able to get a video with my camera of him receiving his diploma! 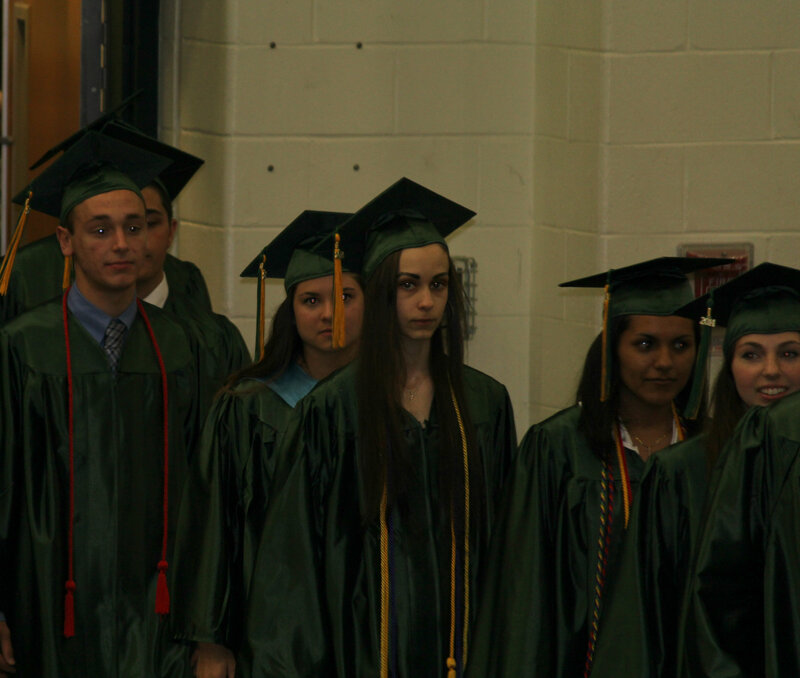 Last year the kids had graduation inside due to rain. It looked really cramped in the main gym. A sea of people. 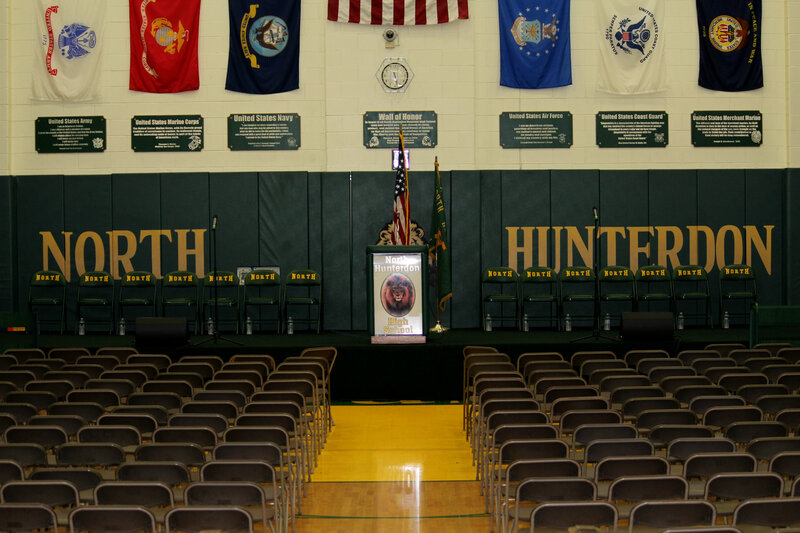 They also set up the auditorium with a live-stream for the extra family member who can’t fit in the gym bleachers. 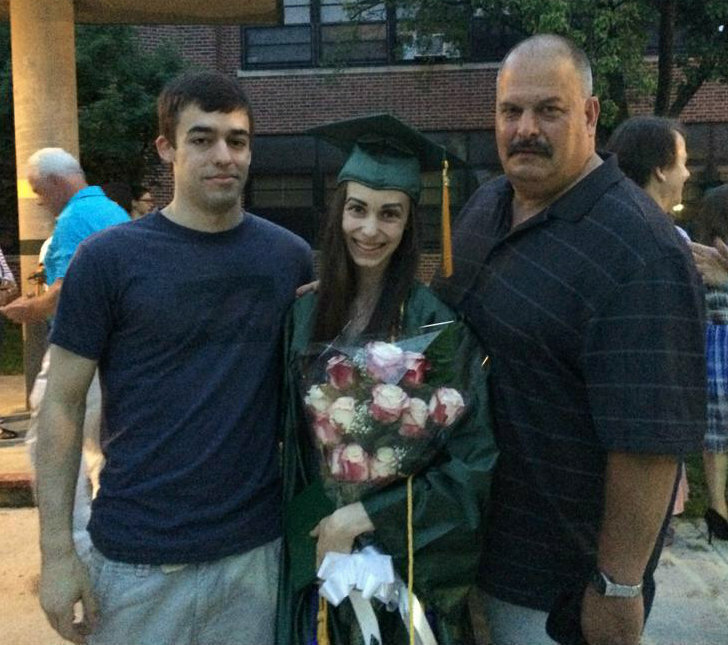 + Doing anything special for Father’s Day? 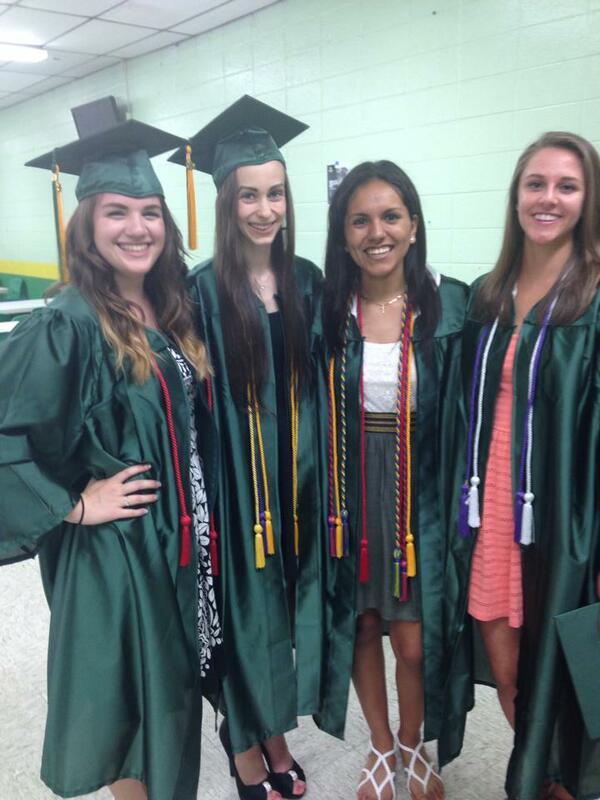 See you Monday with a graduation recap…hopefully! XOXO Have a great weekend! Okay, so the weather was complete crap on Wednesday, but Thursday?! It was so beautiful! In the 70s, bright, sunny, I was in love. Now let’s see how long it stays this way…Anyway, I am so glad this week is over! I had my first full normal week since my college travels and it was needed. It was also very tiring. And next week starts AP tests. Monday I have Psychology, Thursday is Latin, Friday is Photo, and the next Tuesday is US Government. But on the bright side, I really only have a month left before I graduate! And that means I am also almost 18 (Yay, June 6th!)! All so exciting, but I really need the summer, now! On Monday I met with a personal trainer. He is a former body builder and really knows his stuff. So in the next coming weeks after my life settles back down again, I think I am going to start up a whole new fitness routine. I am still struggling to put on any weight and the next step is to work with someone who knows how to “bulk up”. I have really come to a plateau with my strength training anyway. I want to learn how to lift heavy, not lower weights with tons of reps which is what I do now. I only have access up to my 60 lb barbell, and I know I can squat a hell of a lot more then that! I am not seeing the results I want. And when that happens, that means you need to change things up. With that said, I am also so scared. 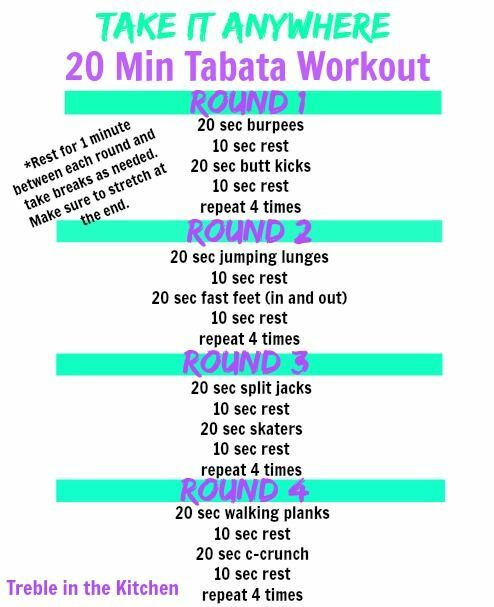 I have been doing my workout style for years and completely changing it is going to be scary of course, but I am up for the challenge. Hopefully this will get my body prepped for things like Crossfit, running, and everything else i have been dieing to do. And of course I will still be doing tons of yoga. That will never change, ever! And you know what’s exciting? I bought a bunch of stuff on Amazon over the weekend, two of these things were yoga books! The first one to come yesterday was Asanas (608 Yoga Poses) book. Yes. 608 amazing poses to practice and learn to deepen my practice! I can not wait to get outside again in the warm weather and practice outside and take tons of yoga selfies like last summer! Woohoo! Thursday: MyYogaWorks, My New Yoga Love! Help yourself get out of that funk. Learn to be satisfied with where you are and you will find peace. 7 great tips to help you make it work! The best thing you can do, is just be you! So true! What do you guys do? Like every comment or individually thank everyone, or, just one big thank you at the end of the day? I completely agree with this. Yes, we should love ourselves and bodies, but we should not be promoting it in such a way that no one acts to fix the problem. Nothing you can’t do! Be aware, acknowledge, and remind yourself. You won’t ever find me binge watching TV shows, but I know I am in the minority here! + Take The Baby Steps. But Take Them. – What Defines Us Is How Well We Rise After Falling. Lucie is such a strong and brave women. Must read! O god, no, I really don’t want children, haha! Is your body telling you to take a rest? Know the signs. You should let it have one. This guy is awesome! Athletes can thrive on any diet when done right. Be kind and compassionate. Inspire and be a comforting guide. It is not good to go all out on every workout you do. Take some slower more moderate days to stay at your peak. This post is much more then just rambles! I can say I made some gains in not being a food snob since I actually ate out! But I still will always be one…always. Well this is embarrassing. I just started eating ALT Bars and now I just feel like a gullible American to the big food companies. It is not so hard once you understand the differences and little tricks that make things work. + Does Washing Fruits And Vegetables Prevent Foodborne Illness? It doesn’t matter if the produce is organic or not, foodborne illness bacteria can thrive anywhere. From the queen of bread baking. I am dieing for sourdough, but it seems like so much work and scary with creating the starter. but I have found some good gluten-free recipes for it…soon…soon it will happen. We are just normal people, like you. Why the special awkward treatment? I have never heard of the pickle juice one! You need to find the cause and heal yourself, not suppress it with medications. They may have found the “trigger point” for the autoimmune reaction to gluten! + Is Adrenal Fatigue Making You Fat? The effects of stress on the body and you hormones. + Counting Calories – Harmful Or Helpful? I guess it does depend, but I know it is not for me. Get on track with that healthy lifestyle! It is not hard; you can do it! I knew it! I was always skeptical about Google+. I made a profile because certain big bloggers said it was a good idea, but no, I never actually use it. It is really just a waste. Well I guess it is all about depth of field. How do you deal with criticism on your blog and in your life? I love Pinterest! But again, my own photos aren’t Pinterest-Friendly! 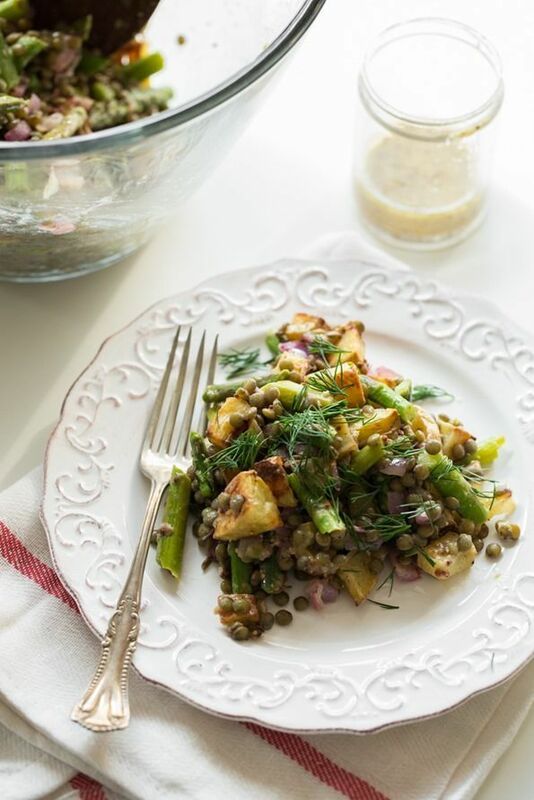 Roasted Potato and Asparagus Lentil Salad with Tangy Mustard-Lemon Dressing. This is all right up my ally! So yummy! 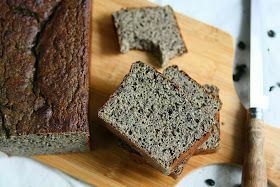 Gluten-Free Black Bean Cauliflower Protein Bread. Wow, the most creative and innovative bread recipe goes to this girl! California Sunshine Grilled Rice Tacos. This is my kind of taco! 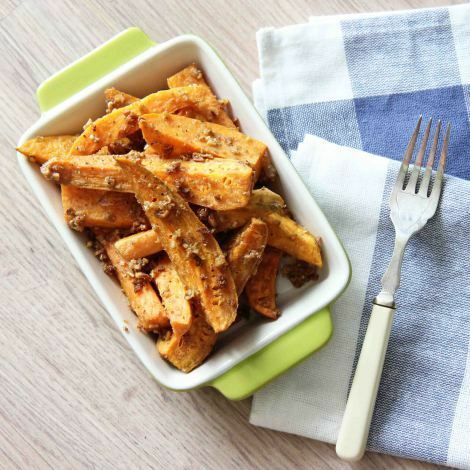 Fennel & Coriander Sweet Potato Wedges. Such a perfect side dish! 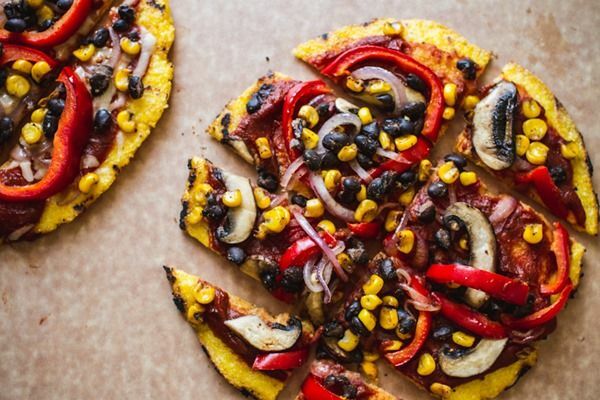 Mexican Grilled Polenta Pizza. This looks like pure gold! 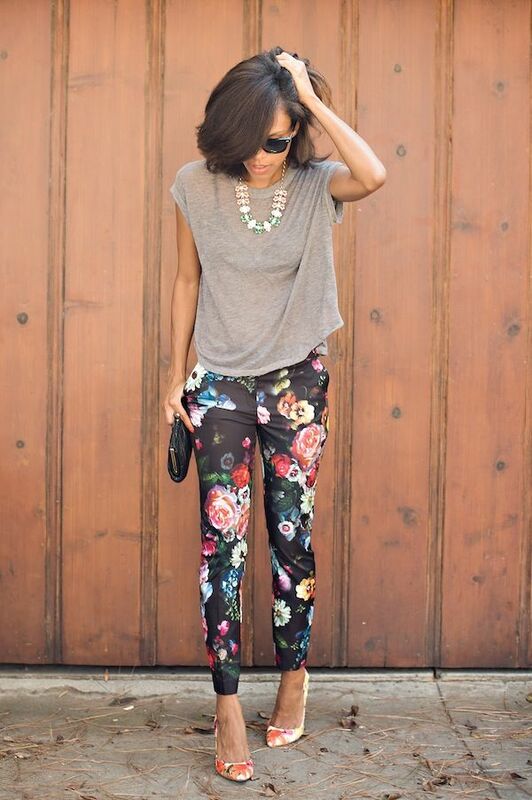 Floral Spring Style. So cute! 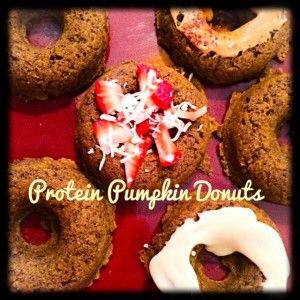 Healthy Pumpkin Protein Doughnut. I need to get me a doughnut pan! 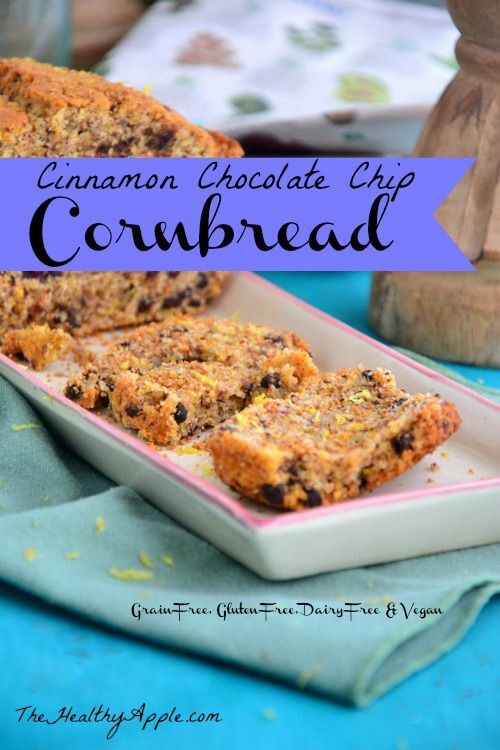 Homemade Chocolate Chip Cornbread. Holy yum! + Getting back into some amazing yoga practices this week. I wasn’t able to do my normal yoga routine when I was away and I really missed it. Thank the yoga gods for some amazing practices! + Have you ever worked with a personal trainer? I know half of you are trainer or fitness instructors! Tell me something for your week! I like to hear good news! I am just full of Yoga surprises this week too! Ekhart Yoga is running a promotion through May 6th for 75% off your first months subscription. Guess what that means…You only pay $3.13! Crazy! I think I may just have to try it out…you can’t beat that price! I will also be doing a quick review post tomorrow which I have procrastinated to the last minute! Make sure you stop by 😉 See you tomorrow loves!